I ventured south to Monmouthshire recently to visit a garden near Usk, in the tiny rural hamlet of Llangwm Uchaf. Reaching, in anticipation, for my Pevsner guide to Monmouthshire (published 2000) I was not encouraged. The old medieval farmhouse is described as ” now miserably derelict” its “towering three storey parlour block of 1599 and its crown of lozenge shaped stacks in the last last stages of collapse”. But for a line drawing detail of a medieval door head, there were, understandably, no pictures. So there was little to prepare one for the scene which suddenly unfolds at the end of a narrow and diminishing country lane. The first clue came when the hedgerow gave way to a geometric, three tiered topiary beech and beyond it a topiary dome of hawthorn. The sight line along the curving road led the eye to some further pathside trimming, small domes of copper beech and green on the left. 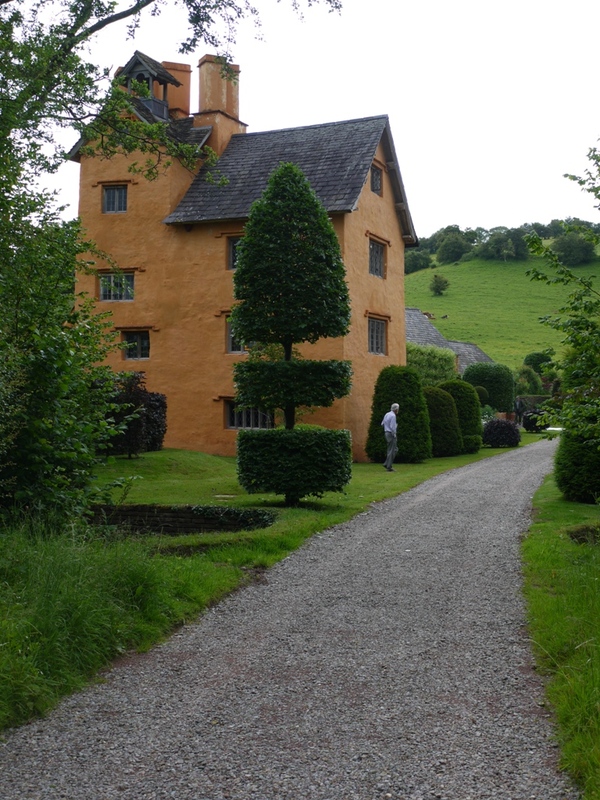 Then Allt-y-bela was revealed. The owner explained the amazing change of fortune for the house since the millennium. Terribly derelict, its principal rooms serving as a shelter for cattle, this amazing house had been brought low by the provision of its 16th century owner and builder, Roger Edwards, landowner and founder of the Usk Grammar School. In his will he left his house and land as an endowment for the school, and over the centuries the huge building became less and less useful to the tenant farmers, while the land remained a source of income for the school for around 400 years. 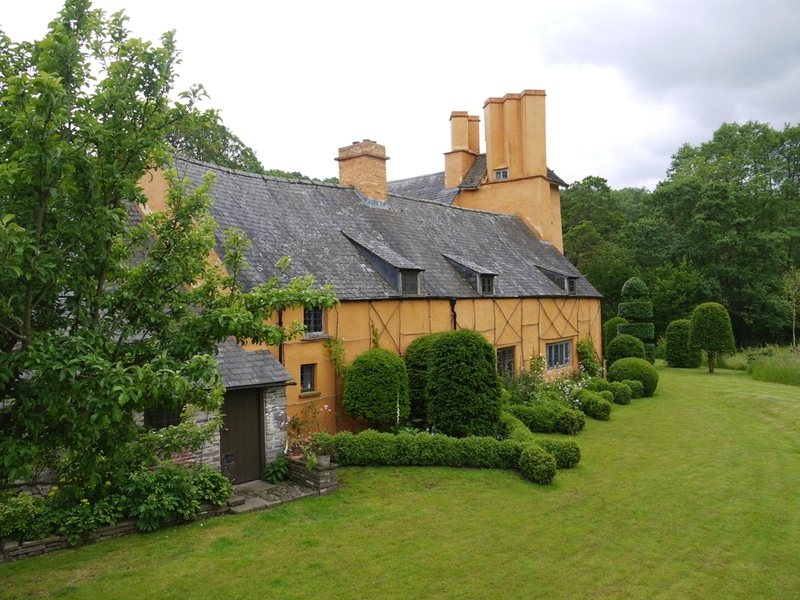 Originally close to the road from Usk to Chepstow, Allt-y-bela had once been something of a hub. Now the route bypassed this tranquil spot, and but for the intervention of the Spitalfields Trust it would have completed its collapse. 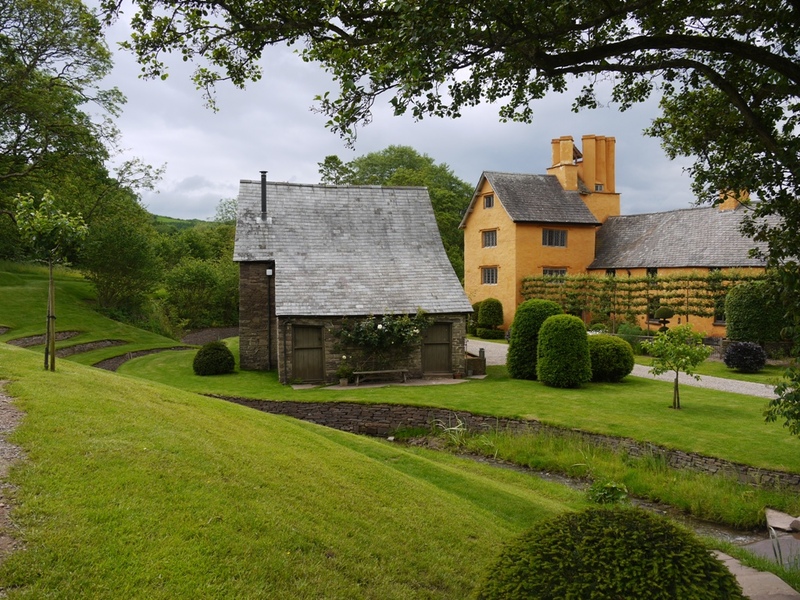 They bought the house and a little land around it, and for seven years conservation experts and SPAB scholars painstakingly restored it to its historical best, a II* listed building. At least there were few layers of alteration and improvement to be stripped away. It was then for sale, a pristine restoration standing on an apron of builder’s gravel and surrounded by grass. 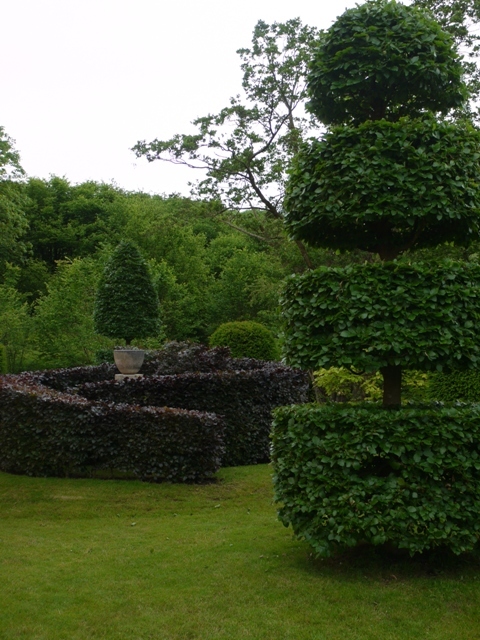 What better purchaser could there be than a renowned garden designer? Arn Maynard is remembered for his RHS Gold for the Laurent Perrier Bicentenary Garden in 2012 and has an extensive garden design practice. Here he had a blank palette and has created a modern garden which in part evokes the styles of the house’s history. Bringing in large ready trimmed topiary trees from Holland, and sculpting the land with diggers and drystone wallers has enabled him to present his vision of Allt-y-bela, as a pearl set upon a cushion of green. As so often in rural settings, one of the challenges is to integrate a garden into the wider setting, and this is achieved by allowing the mown and lawned garden to expand into wildflower meadows, rich in ox eye daisies, orchids, ragged robin, campion and yellow rattle. 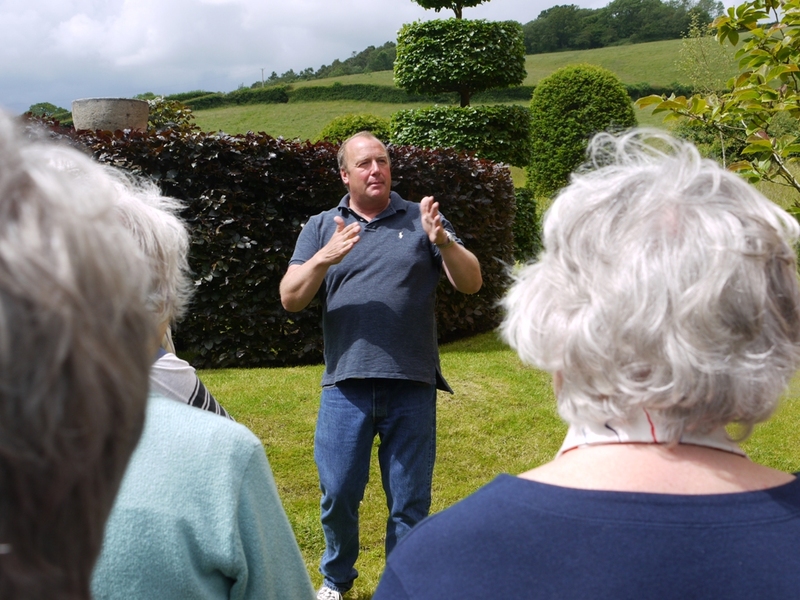 It is difficult to believe that such a sense of permanence has been achieved in just seven years, but then his Laurent Perrier show garden featuring a huge pear tree and pleached fences was created (with a lot of pre-planning) in just 17 days. An assortment of geometrically layered and domed trees frame the approach to the house, and a simple concentric labyrinth of copper beach leads one to an urn, and out again. There are also choice trees like Magnolia and the service tree which are spared the shears. The spiral of copper beech leads to a central urn, and then out again along a parallel arc. At the back of the house, the land has been gently shaped into a terraced lawn, while close to the house a criss-cross stitching of clipped box creates intimate compartments for old fashioned flowers, and a lattice of hedgerow poles creates a trellis up the walls. 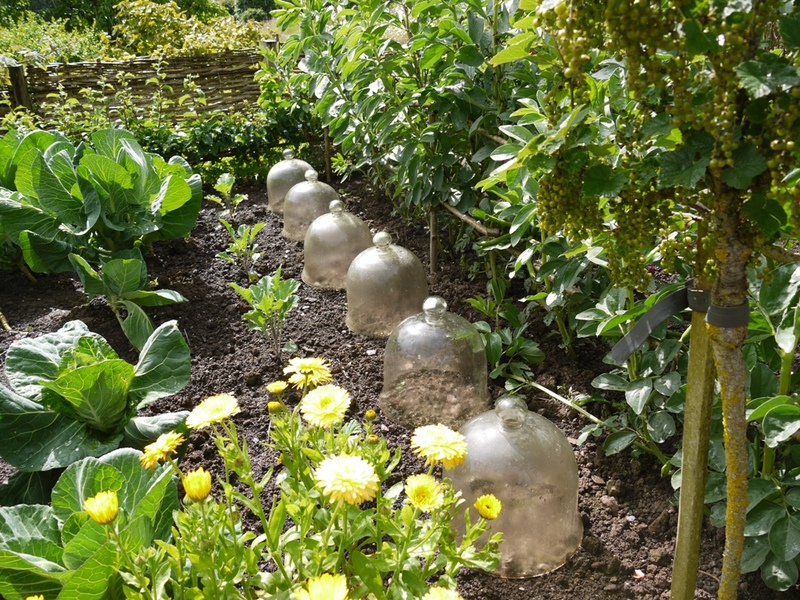 Further beyond the lawn is an exquisite vegetable garden, with pear arches overhead, and stepover cordoned apples such as were not dreamt of in the 16th century. There are fruitful gooseberries, currants and raspberries, alpine strawberries, broad beans and peas. The house had a separate stone built kitchen and granary facing the front facade, and these and all other outbuildings have also been carefully restored. It is on this side that the land art is particularly striking: the trickling natural stream has been canalised between immaculate dry stone walls to curve around behind the granary. 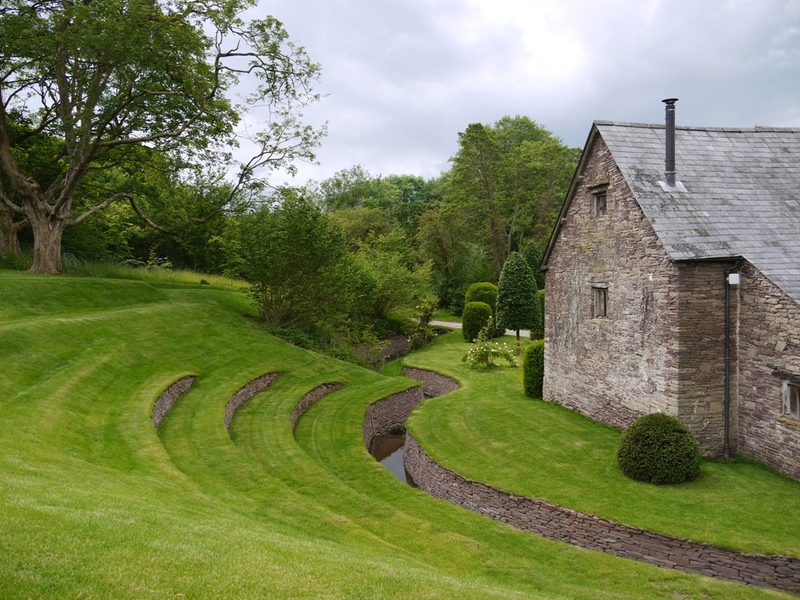 Further low drystone walls contour the slope above to create an outdoor auditorium, looking down to a small stage of lawn trapped between the stream and the building. The first performance held here was The Merry Wives of Windsor. There is more to describe:- the tall screen of pleached crab apples in front of the house, the wandering bantams in their timber house, the auricula theatre and the stately Bengal tomcat. No medieval home was as exquisitely elegant as this, but if it had been, Roger Edwards would have been proud.